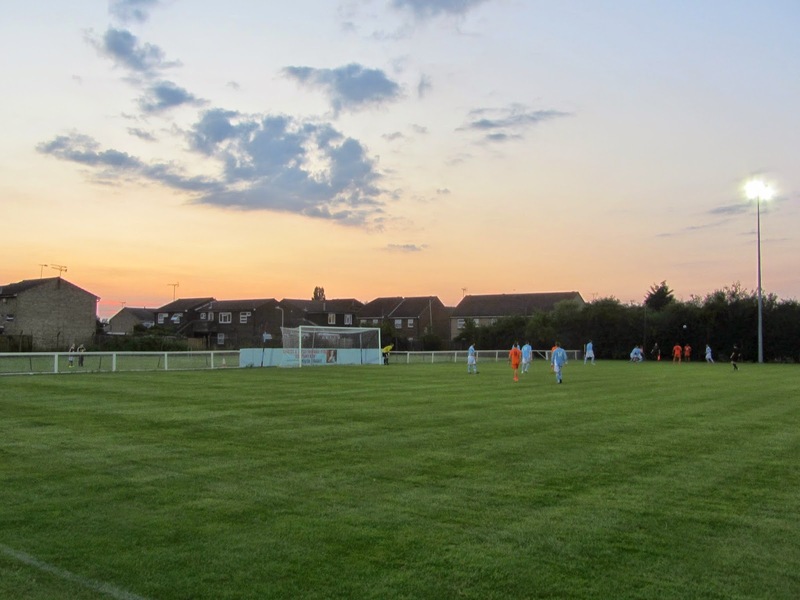 My thirteenth stadium of 2014 was on Tuesday 29th July at Crown Avenue in Pitsea, Essex. The match was Bowers & Pitsea vs. Maldon & Tiptree in a friendly. 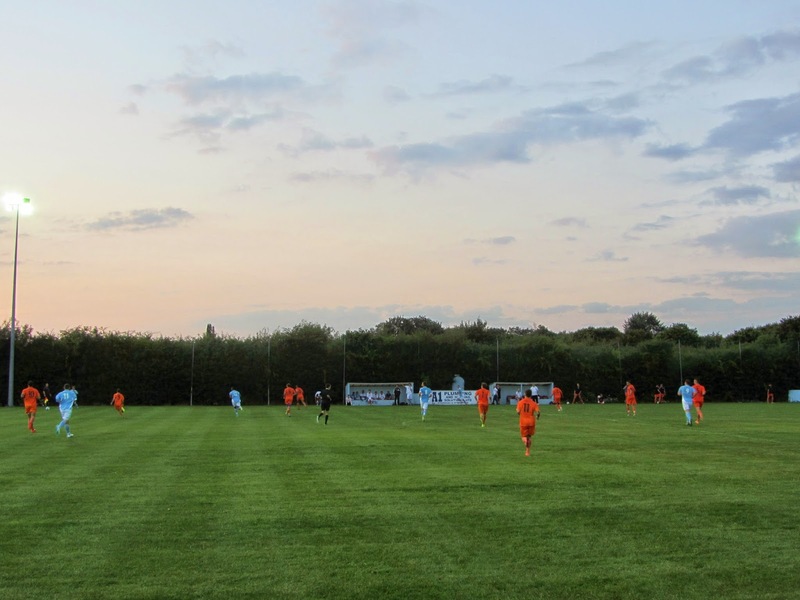 Crown Avenue, also known as the Len Salmon Stadium, is located on the outskirts of Pitsea with trees and fields on three sides and housing on the other. 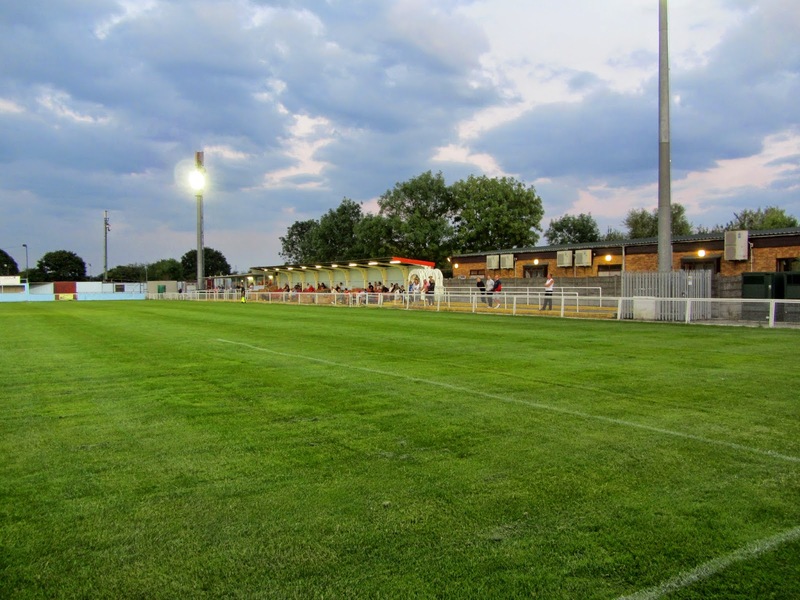 The stadium is 1.5 miles from Pitsea railway station. The south side of the stadium has a covered all-seater stand at the centre of it with room for around 180 people. To the east of the main stand is a covered area containing a food outlet and to the west of it is a small uncovered concrete terrace. The rest of this side of the ground is uncovered hard standing. As the northern side of the ground is hemmed in by trees there is only room for the the two dugouts with nothing in the way of spectator areas. The remaining areas for fans to view from are behind the two goals - there is a covered terrace behind the goal at the eastern end of the ground and uncovered hard standing behind the goal at the western end of the ground. The game was a friendly match between Essex Senior League side Bowers & Pitsea and Isthmian League Division One North side Maldon & Tiptree. There was a dramatic start to the match as the visitors went 2-0 up in under 2 minutes. After 50 seconds the ball was lifted over the top to a Maldon striker who lobbed the advancing keeper and just 55 seconds after this Bowers failed to clear their lines and a 25 yard strike found its way into the net. The home side were really struggling and only some good fortune prevented the visitors from extending their lead until the 24th minute when another 25 yard effort was shot into the bottom corner. In the 27th minute it was 4-0 as a corner was whipped into the box and nodded home by a Maldon player. In the 32nd minute the hosts grabbed one back after the Maldon goalkeeper lost possession on the edge of his box and the ball was squared for a Bowers striker to tap in. The respite did not last long though as Maldon then scored another 2 goals within a minute - the first from the edge of the box and the second when a ball was sent across the box and with all the defender missing it the midfielder at the back post was able to slot home. The hosts saw out the 10 minute before the break but went in 6-1 down. Having being torn apart in the first half the home side re-organised at the break and put on a significantly better display in the second 45 minutes. On the hour mark there was an unsavoury incident when a visiting player appeared to headbutt a home player who then raised his arms in retaliation. The referee sent both for an early bath. In the 66th minute Maldon had a chance to notch up their 7th goal of the game when they were awarded a penalty but the goalkeeper was able to palm the ball away. Bowers were able to dig in and stop the score getting any worse which, after their first half display, must have been a big relief.